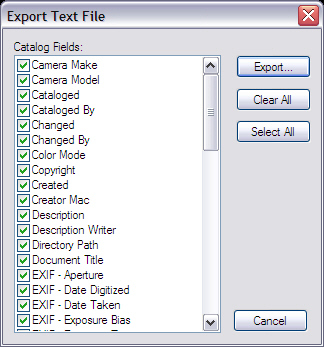 The dialog includes a list of all built-in and Custom Fields that can be exported, i.e. all but a few built-in Fields (for more on Fields see here). On the left is that for v7, on the right that for v8.0+. You can use buttons to select or de-select all Fields and then refine the list by mouse left-clicking in the boxes to the left of the Field names. You can click-drag the list entries to order the Field data as you wish. All ticked Fields will be exported for all currently selected Record(s). Clicking 'Export' will open a file save dialog allowing you to choose were the output file should be created. The data is exported as tab-delimited text, one Record per line. The first line of the exported file will show the Fields being exported (tab-delimited) in the order they are presented in the data lines. When importing to another Catalogue this first caption line is ignored - so don't remove it. Multi-value fields have their values separated with ASCII value #29 - which show up in Notepad as squares (non printable characters). ASCII #11 is used in Text Block field data as the hard line return symbol. 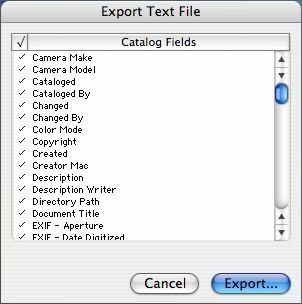 If data is being exported for subsequent import to another Catalogue, you must ensure that any Custom Fields in the source data are created in the target Catalogue before import. Otherwise data for non-existent Fields is not imported - Portfolio will not add the Fields for you (it doesn't know what type they are! ).